David Duke's View Of An Obama Presidency David Duke, a former Ku Klux Klan leader, Louisiana state legislator and onetime presidential aspirant, shares thoughts on what an Obama administration would mean. "I don't think that he or McCain or even the political establishment of country defends the rights and heritage of European-Americans," Duke says. The U.S. Department of Justice has responded to a 'Tell Me More' request for crime data based on race, addressing statistics referenced by David Duke during an on-air conversation last month with NPR's Michel Martin. Michael Rand is a statistician with the Bureau of Justice Statistics, a division of the U.S. Department of Justice. Rand speaks to 'Tell Me More' producer Brakkton Booker about why the agency disagrees with Duke's interpretation of their data. The U.S. Department of Justice responds to crime data referenced on-air by David Duke. Duke discusses the recent discovery of an alleged plot to assassinate Barack Obama, U.S. immigration and segregation. The 'Tell Me More' series 'What If?' explores the potential significance of a first-elected black president in the U.S.
David Duke — former Louisiana state lawmaker, grand wizard of the Knights of the Ku Klux Klan and onetime presidential aspirant — offers his thoughts about this year's White House candidates in an interview with NPR. Duke expressed concern about Sen. Barack Obama's candidacy but argued that Sen. John McCain has "betrayed" what he describes as the "European-American majority." Duke, who denies he is a white supremacist, also shared his views on segregation and discussed the current path of the U.S.
And so, what do you call yourself? You're not a white supremacist. You call yourself a white-rights activist, or what? I would say it's a flip side of Barack Obama. He was a community activist or a black activist. He's been in the church for 20 years that — and one of the first principles of that church is that they are, quote, "true to Africa," loyal to Africa. There is nothing wrong with Barack Obama working and having a long career advancing what he sees as the black community interests or the black perceived interests as a group, collective interest, but I did see it as kind of odd that a man of that stripe would become president of the United States. It seems like — I think I should endorse him for president. For many Americans, they say this is kind of a culmination of America's best self. 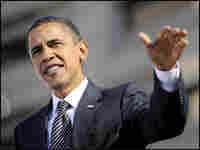 Here is a person who is biracial as a parent, born overseas and yet he has risen to prominence in this country. What does his biography mean to you? Some might think this is your worst nightmare come true. First of all, let me say this. I was lucky enough to have a loving present father in my family. I am sorry [about] the fact that Obama didn't have a father that was there for him. And I can appreciate the fact that he has achieved — that he got a degree. He's gone to Harvard University. He has been a teacher. I am today a Ph.D. myself. ... He's got to appear like he is for everybody, but Barack Obama, and I must say, as well as John McCain, support so-called affirmative action. And affirmative action is a very nice term for racial discrimination against better-qualified white people in jobs, employment, promotions and scholarships, and college admittance. So, I don't really buy all this malarkey. I don't think that he or McCain or even the political establishment of this country defends the rights and the heritage of European-Americans. We now have an immigration policy. First of all, we're not enforcing our immigration laws, and illegal aliens are coming in by the millions. But also we've got massive numbers of non-European immigrants coming in, which will change the status in America from an overwhelmingly European-American nation to an overwhelmingly non-European-American nation. And so, do you object to Barack Obama's presidency — or being elected — based on his race, or based on his positions, political positions? That's not change. 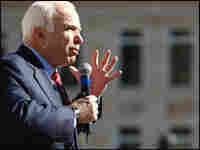 Well, I think I'd rather have anybody of any race who defended the rights of European-Americans and heritage than I would have a European-American who actually betrays our people like John McCain has betrayed us. He is Mr. Amnesty in the illegal-alien issue. But Barack Obama is not a person who would defend the rights and heritage of the European-American people. He is right with the rest of the establishment in basically taking away the rights and traditions and values of European people that built and created the foundations of this country — our Constitution, our Declaration of Independence, our values, our traditions, our culture — and I think we're losing those things. I love these things very dearly, and you know, I also think the people of Tibet have the right to preserve their culture. What is your vision for what this country should be like? Let's say the next 10, 15, 20 years, what do you want this country to look like? Well, I have the same vision I think that the Founding Fathers of this country had. My vision would be a nation in concert with its traditions, its values, its heritage, a nation where our children are safe in the streets, where we have decent education, where the vast American majority is not facing racial discrimination. We have a vast disproportionate crime rate in this country, at 37,460 white women who are raped or sexually assaulted by black males, as according to the United States Justice Department.